Welcome back to Beard on Books. November is my personal favorite time of the year. It is recognized as the national time to give thanks. 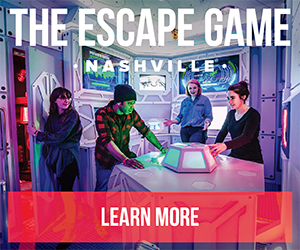 In that light, below is your buffet-style menu to eat up and appreciate all things literary around Nashville this month. To start things off just right, Matthew Johnstone is back on the scene in full effect. On Sunday, Nov. 11, Et Al. 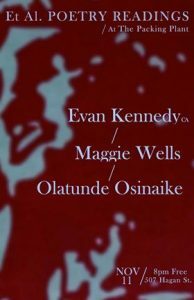 Poetry Readings will host Oakland poet Evan Kennedy and Nashville poets Maggie Wells and Olatunde Osinaike at its new location, The Free Nashville Poetry Library at The Packing Plant. Poetry in the Brew, the open-mic series with featured guests, takes place every second Saturday of the month at Portland Brew East (1921 Eastland Ave.). This month, on Saturday, Nov. 10, from 5:30pm-8:30pm, open mic signup is at 5:30pm, and readings start at 6pm sharp. The event is free to attend and fills up quickly. 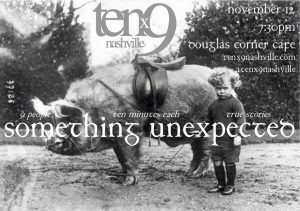 Tenx9 Nashville Storytelling, hosted by Michael T. McRay, gives nine people have up to 10 minutes each to tell a real story from their lives. Each month has a theme, and every month is free to attend. On Monday, Nov. 12, from 7:30pm-9:30pm at Douglas Corner Café on 8th. The theme of this show is Something Unexpected. On Saturday, Nov. 3, Amy Jackson will be hosting a multimedia art reception for her tropical landscape paintings at Plaza Mariachi. At 6pm, Mo Christo will be hosting the open mic. All languages and people welcome! The Scarritt Bennett Center (1027 18th Avenue South) will again host its monthly Poet’s Corner series on Thursday, Nov. 15, at 7pm. The featured poet for this round of reading will be Catherine Moore. The Vanderbilt Writers Series will be on fire this month with three must-see events. On Thursday, Nov. 8, from 7pm-8pm at Buttrick Hall, Room 101 (Vanderbilt University), Vanderbilt Creative Writing will be hosting poet Cathy Hong. On Thursday, Nov. 15, from 7pm-8pm, at Buttrick Hall, Room 101, they will be hosting Piyali Bhattacharya and Justin Quarry. Then, on Thursday, Nov. 29 at the same time and place as the other two above, Vanderbilt Creative Writing will host none other than the awesome local poet Lisa Dordal. All of these events are free to attend. Parnassus Books will be bringing some big-name authors from out of town to your back porch, per usual. Parnassus Books has several author events each month, in the store and around town as part of the Salon@615 partnership with the Nashville Public Library Foundation. 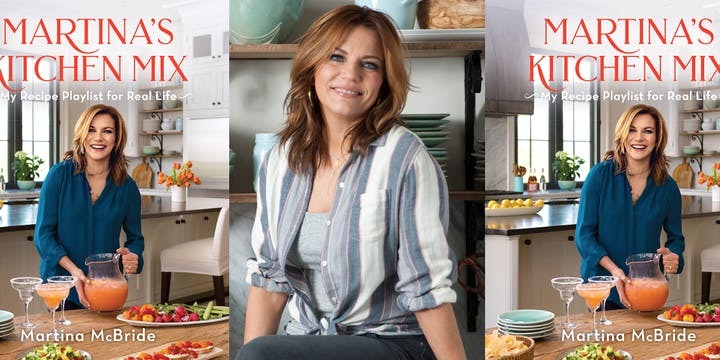 This month’s calendar includes store appearances and readings by the likes of Erica Wright, Barbara Kingsolver, Martina McBride, and many more. 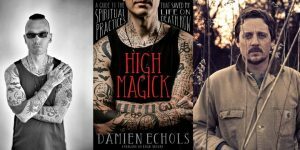 On Thursday, Nov. 8, at 6:15pm, at Unity of Nashville (5125 Franklin Pike), Salon@615 will host a very special edition with author Damien Echols and singer Sturgill Simpson. This month, The Porch Writers’ Collective continues to have more workshops than I can keep track of in one post, but you’re one click away from finding whichever one matches your wildest writing desires. Visit the PorchTN.org to discover more details about The Porch and the many workshops it offers. On particular event/seminar that The Porch is co-hosting with Arts & Business Council of Greater Nashville at their favorite local bookstore of Parnassus Books is the Paths to Publishing with The Porch on Thursday, Nov. 15, from 10:30am-11:30am. With panelists such as Julie Schoerke, Margaret Riley King, Lily Wilson, Ginny Smith Younce, Jennifer Chesak, and Claire Gibson, you can’t go wrong with this one. You’ll need to get your ticket before you attend, but you can find that here. The Bookshop (1043 W. Eastland Ave.) will continue to host its weekly Saturday Storytime at Her Bookshop every Saturday, at 10am, for the month of November. I will again be hosting two East Side Storytellin’ shows in November. East Side Storytellin’ 141, on Tuesday, Nov. 6 (Election Day AND our sixth anniversary show! ), at 7pm at The Post (1701 Fatherland Street) features Joe Pagetta and Joe Pisapia. Two weeks later, November 20, at the same venue and time, East Side Storytellin’ 142 will feature Simon Tam and Nathan Belt. Both events are free and BYOB. Kory Wells is back with her usual Poetry In The Boro event (www.facebook.com/PoetryInTheBoro). On Sunday, November 11, at Murfreesboro Little Theatre (702 Ewing Blvd. ), this round of Poetry In The Boro will feature Carlina Duan and Sarah McCartt-Jackson. Doors will open at 6:30pm and features begin at 7pm. After the featured poets, there’s time to mingle and purchase books before the open mic time begins. 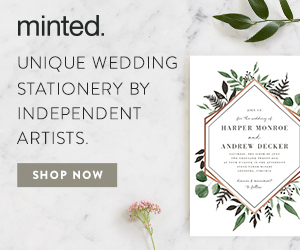 Readers can share one piece of poetry, spoken word, or even short prose. (If your piece is over four minutes long, please speak to the hosts beforehand.) Also, this month’s challenge theme is Pauses Off the Path, coinciding with an exhibit by Murfreesboro photographer laureate Gale Stoner at the Center for the Arts on October 24. I hope to see you at everything above, especially all of the events involving East Side Storytellin’ and everything else promoting more love than hate this month. If I don’t, I hope to see you again before Christmas. Until then, I hope you have a great month ahead. Remember to be nice to one another out there. Ed. Note. Beard on Books is survey of events. 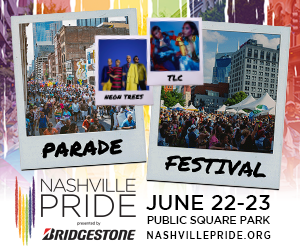 For a comprehensive list of upcoming literary events, be sure to check the Arts > Literary section at NowPlayingNashville.com.